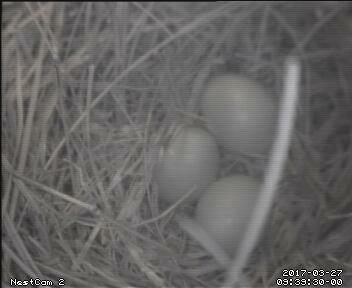 The Eastern Bluebirds have returned to the nestbox and successfully laid 3 eggs. Susan witnessed a standoff the other day between the Bluebirds and the Chickadees at the nestbox. Waiting to see if that was the end of the Hatfields versus the McCoys. Thanks for visiting, Susan and Jim.